I’ve had a number of people ask what are the guidelines for phased closings at Disney World, so I thought it might be easier to just sketch them out. Phased closings are a result of capacity issues. 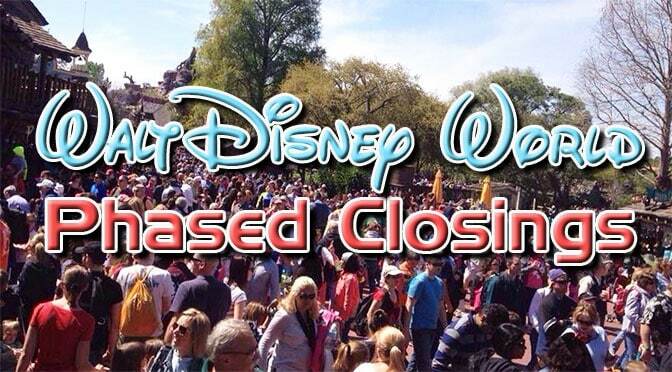 Magic Kingdom is the park most likely to have a phased closing and Epcot is the least likely due to its immense size. Generally speaking a phased closing at the Magic Kingdom will mean at least 80,000 people will enter the park at some point during the day. Disney World uses this technique of slowly blocking and unblocking certain ticket types to manage crowd flow. Dates below reflect the highest level of phased closing reached on that date. Magic Kingdom reached April 8 and 9, 2009; December 28 and 30, 2009; December 29, 2010; December 25 and 28, 2011; December 24, 25, and 30, 2012; December 25 and 30, 2013; July 4, 2014; December 31, 2014. Guests staying at a Walt Disney World Resort and Walt Disney World Swan and Dolphin using Disney transportation. Magic Kingdom reached April 7, 2009; December 29 and 31, 2009; March 30, 2010; December 25 and 31, 2010; December 31, 2011; December 27, 28, and 31, 2012; January 2, 2013; March 25-28, 2013; July 4, 2013; December 31, 2013. Closed to all guests until the Phased closing is lifted. I remember MK closing park admittance over Christmas and New Years 2009. We were there….thankfully, we were Resort guests and the only thing that affected our fun was the amount of people in the park. Shoulder to shoulder Disney goers. Overwhelming. At least for our family. We stick to week nine, now. Fun to experience the insanity at least once, though! All 4 parks closed in on October of 2016 for Hurricane Matthew. That is just nuts. I can’t imagine even being in the park for a Phase 1 closing. It would be a madhouse. I’ve been during pretty busy times – I remember Spring Break 2010, I could barely walk in Fantasyland in the afternoon (took us forever just to pass through! ), and I’m sure they were nowhere near even Phase 1. Hopefully I will NEVER experience a park so busy they have to start refusing entry to certain folks! Has phase 4 ever happened? I would be SO bummed to be a resort guest and be turned away.